That’s my experience, anyway. 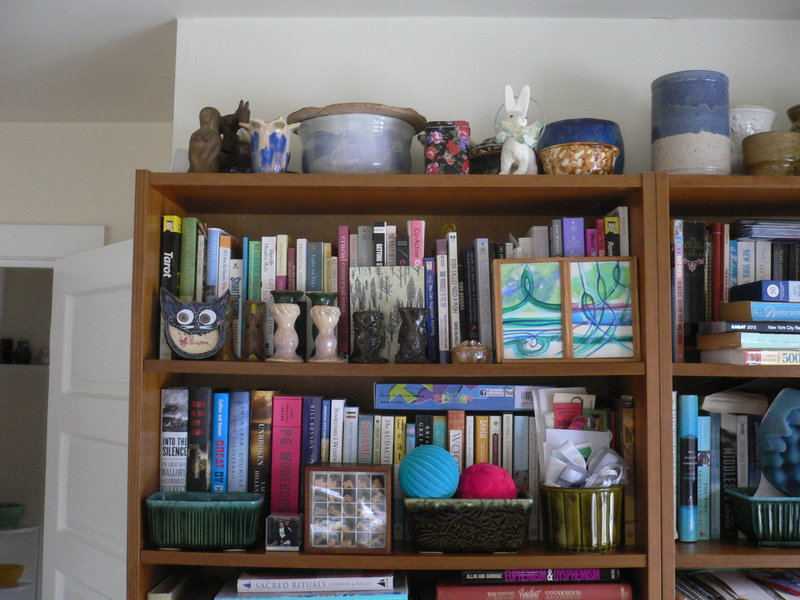 Every bookshelf in the house is full to overflowing; many shelves carry two or three rows of books. In the kitchen, our cabinets are always groaning with everything from pantry staples to exotic ingredients. Upstairs, I never have any shelf space in my closet despite the two or three trips to Goodwill I make each year. And then there’s the basement. We have several shelving units down there: one for tools (and whatnot), one for paint (and the like), yet another for seasonal items (such as Christmas tree decorations and pool furniture cushions). Whenever a space opens up (e.g., when we put the cushions outside in spring), it is soon filled with something else (e.g., a box of the previous year’s records that was sitting on the floor for lack of shelf space). It’s a good example of what I might call the “Shelf of Dreams” Law which holds that if you build it (a shelf), they will come (items to be stored). 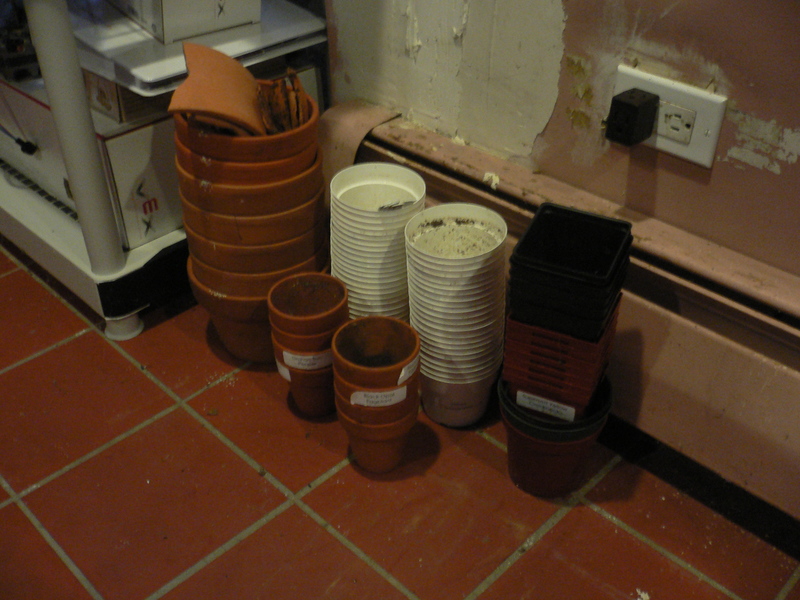 This law immediately became apparent when we began planning our indoor seed sowing for the coming growing season (believe it or not, we should be starting this month) and I made a trip to the basement to prepare. Recall that last year, we constructed a simple seed-starting apparatus to facilitate indoor growing (see March 17, 2013, part 2, for details). And what did we use as the basis of our apparatus? That’s right, a shelving unit. Shortly after we assembled the shelves, we filled them with seed trays. 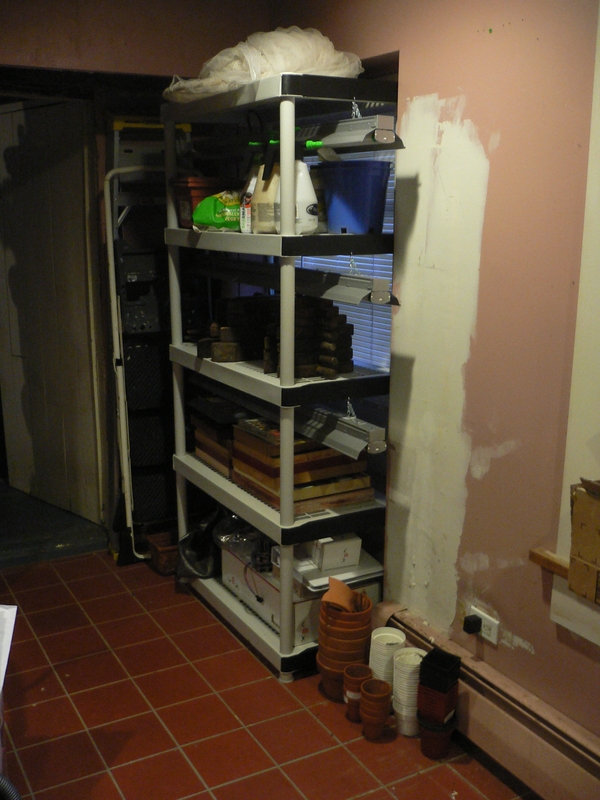 A few weeks later, after we set out the seedlings in spring, the shelves became empty again. That condition did not last long. First, I started placing miscellaneous gardening supplies there: spray bottles, sacks of soil amendments, plastic seedling pots. Then, in mid-summer, we held a big party for our 25th anniversary. We needed room elsewhere in the basement (for the caterers) and so anything that did not have anywhere better to live moved to the seed-starting apparatus. By the end of the summer, the shelves were full. Which was fine through the fall and into the start of winter. But now it is time to make space for the seed trays again. It will take some effort—there’s a lot of stuff to relocate—but I’m sure I can find an open shelf or two somewhere in the house. We spent some time today planning our Thanksgiving meal. The menu is based on tradition so there are not many choices to make. Typically, our trusty-dusty recipes dominate although we will usually consider the variety of choices presented in the November food and cooking magazines. Often, but by no means always, something new can be accommodated. Not this year, though. To work around work and travel schedules, we are having the main meal early—the Wednesday before—and taking it on the road. We’re still the cooks, so everything must be made ahead. Further—and, hey, no pressure—we’ll be joined by relatives visiting from out of town. This is no time for experimentation. We always start with the basics: roasted turkey, stuffing, mashed potatoes, gravy and cranberry sauce. Then we add another starch, some variation of sweet potato casserole or a second stuffing (and probably, I should use the term dressing because we haven’t stuffed a turkey since 2001). Yesterday’s New York Times Dining section (see “Essential Thanksgiving”) referred to this menu component as “something orange”, a clever characterization that they expanded to include macaroni and cheese. We agree with the philosophy that there should be something green on the table to round out the menu both in nutrition and color. In past years, we have prepared everything from Brussels sprouts, kale, and even an arugula fennel salad (although salads are my least favorite contributor from this group). Most recently, we have been making green beans with walnuts in a lemon vinaigrette which is a perfect complement to the meal (the dish’s acidity refreshes the palate) and has the added advantage of being relatively easy and quick to prepare. I like to start the meal (while the turkey rests) with a small glass of Bourbon. This is not my usual cocktail choice but the Bourbon and its perfect accompaniment of roasted, salted pecans are uniquely American. Both items seem appropriate for Thanksgiving which, although not uniquely American (Canadians celebrate it in October), is in part a celebration of being American. What’s that, you say? Today is January 6, 2014 so how can this post be from the future? Well, it may be January 6, 2014 in the real world but in my blog’s timeline, the date is currently October 24, 2013 (my most recent post). In fact, the garden engineer calendar has been stuck in October for quite some time now. This is mainly because in the last two months, there have been many things to which to chose to say “yes” or “no” to. With the garden fully dormant (spoiler alert: the growing season has ended! 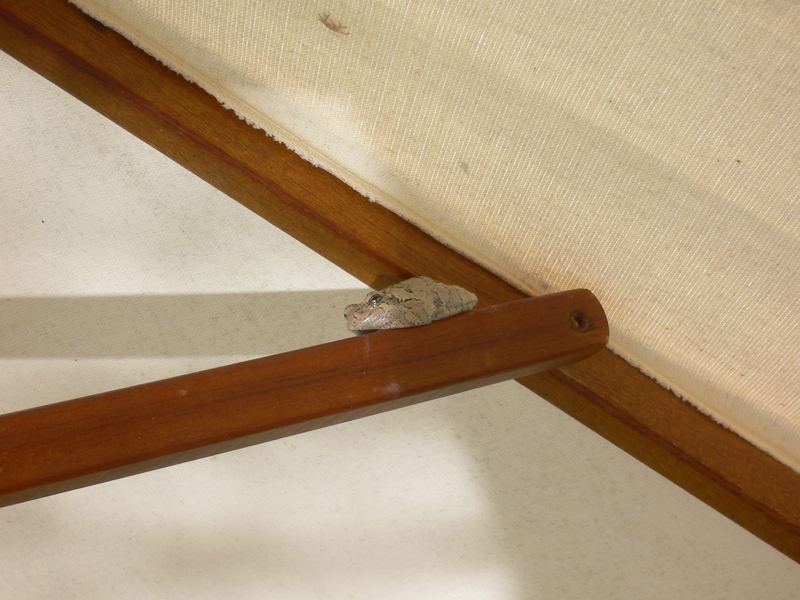 ), I elected to say “no” to it and its blog and “yes” to some of those other things. But now that the holiday season has passed (another spoiler alert: Thanksgiving and Christmas have already occurred and were the best ever! ), I have time to loop back and fill in some of the missing posts from the end of 2013. My brother made the excellent suggestion that I simply do a single, catch-up summary but I’m afraid that I am much too literal- and serial-minded to be able to do that. Besides, some of the posts were already (mostly) written. Instead, over the next week or two I will continue the chronology that garden engineer has been following from the start, including only those posts that pertain to actual events during year’s end. For topics that are less temporally fixed, e.g., season recap, soil testing results, planning for this—I mean next—maybe I do mean this—year (time travel is difficult), I will wait until after I have caught back up to the present day. With luck, that will be soon. For those readers who feel that 2013 ended too quickly, this might be a welcome extension of the fall and holiday seasons. Others may wish to skip ahead. 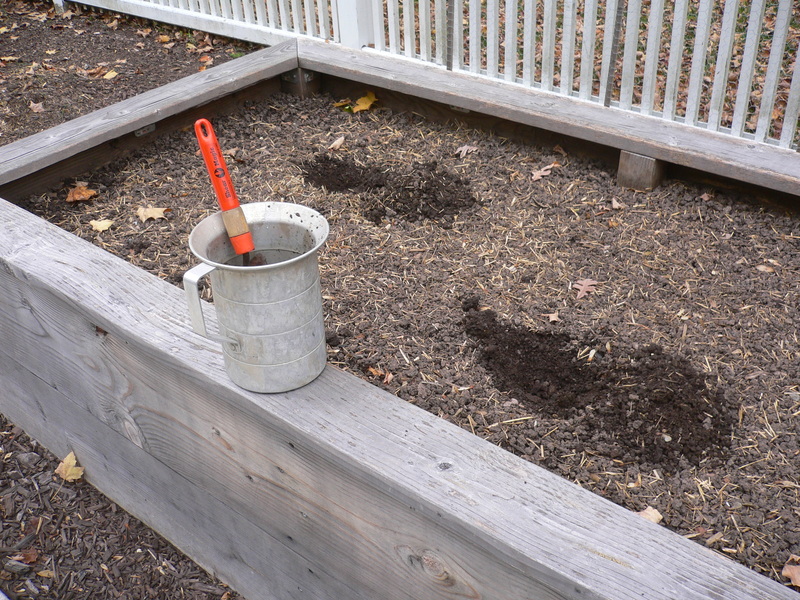 It’s that time of year again (past time, actually): Time to send the soil out for testing. Why is it that time? 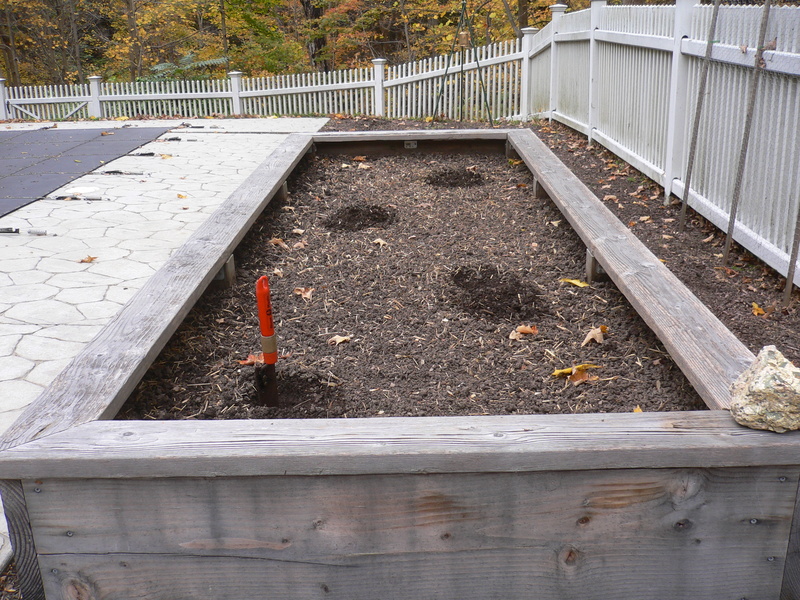 Because the growing season is over and the soil is as depleted as it will get this year. Now is the time to add supplements or nutrients that the soil may need before the new season starts in spring. And I won’t know what to add without an assessment of what is—or is not—there. Also, the planters are (almost) bare so it is convenient to take samples. Testing is becoming less critical for the east planter, which has just completed its third year of service. Its soil needed adjustment after the first year (to increase its acidity) but received no amendments last year. We did add a small amount of compost (to bring the soil surface higher) and may do so again this year. Otherwise, I don’t expect that the soil’s properties have changed much. Similarly, the soil in the west planter was nearly on the mark in terms of pH and nutrient concentrations, as evidenced by its first soil testing last year (see October 4, 2012). It received the same treatment as the east planter (a minor infusion of compost) and in conjunction with the solid performance of this year’s crops, is unlikely to need any modifications. The condition of the newest soil in the garden, the mounds where we planted the squashes and cucumbers, is another matter entirely. 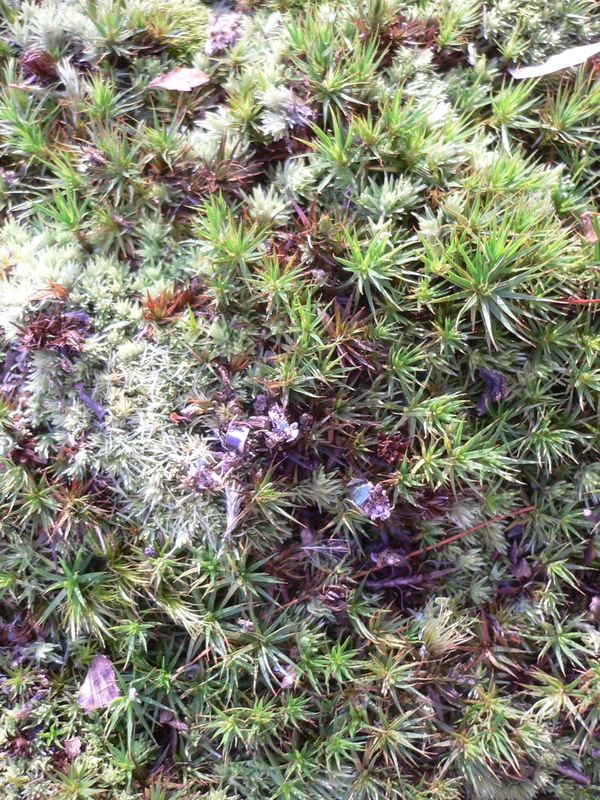 We were not particularly careful in designing this soil and simply mixed together roughly equal parts of compost and peat moss. It looked right and was good enough but apparently only just so. 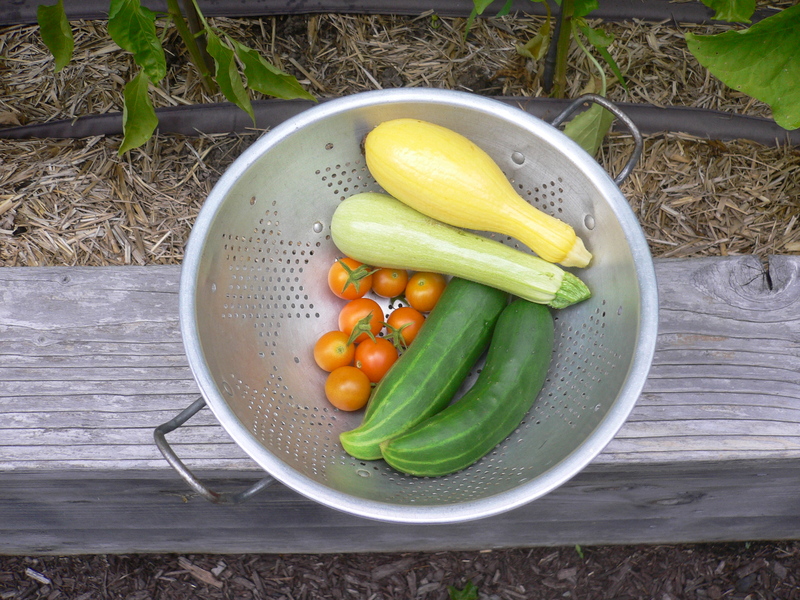 While the summer squashes performed adequately (especially the yellow crookneck), the winter squashes and cucumbers did poorly (in fact, only one Kabocha and none of the Delicata squashes reached maturity). Clearly, there is something missing from (or otherwise not quite right with) this soil. Testing should help uncover what that is. 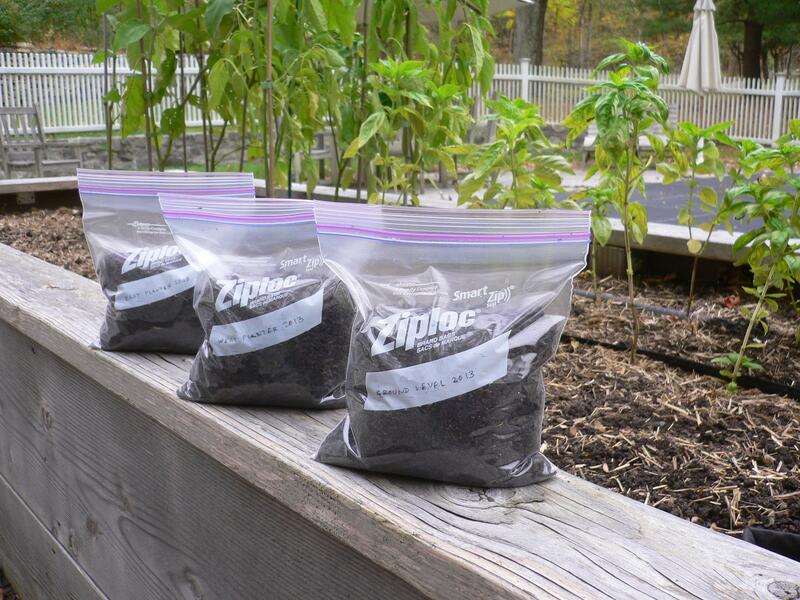 As in previous years, for each of the planters and the mounds, I dug soil from four locations, mixed it together and dumped it into a labeled zip-top bag. I slipped each baggie into a larger one (to contain possible spillage) and packed the three sacks into a box for shipping. To the box I added the testing lab’s forms (one for each sample) and a check to cover expenses. Next week, I’ll send them to New Jersey and in another week to 10 days, we should have the results. The string beans weren’t the only plants that got pulled out this weekend. The tomatoes, about which I have been obsessing lately, have not been improving despite my pruning of several days ago (see September 27, 2013). Once infected with late blight (the suspected culprit), the plants have little hope of recovery without the use of fungicides. 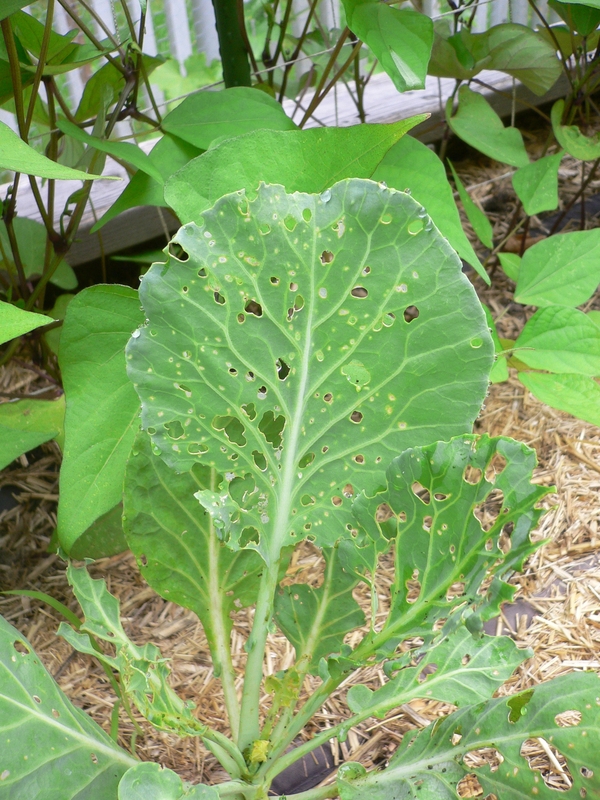 Late blight is caused by oomycetes, non-photosynthetic fungi (perhaps that’s redundant?) that spread through the production of millions of oospores. Oomycete is a cool word but it is a very uncool organism. I have read about using a baking soda spray in several publications and websites (see, for instance, Late Bloomer’s Episode 2.16) and will probably try that next year, starting early in the season to prevent onset. We’ll plant the tomatoes in the west planter—the best we can do, in terms of crop rotation—and keep everything as clean as possible. However, given the ease with which the oospores spread and their ability to survive, underground, through severe weather, we are at a disadvantage (and greatly outnumbered). It’s much too late for any kind of spray this year so I pulled out the spindly vines of the Sungold, Black Cherry, Brandywine (red and yellow) and Aunt Ruby’s German Green tomatoes that remained. There were plenty of green (i.e., unripe) tomatoes but none that were fit to eat. On all of the plants suffering from blight, the disease had spread to the fruit. I don’t mind a rotten spot or two or even the occasional wormhole or bird peck, but the brown lesions, with their white spore sites, make even the best looking tomato unappetizing. I’m happy to say that the plants were otherwise healthy and had produced extensive root systems (which required a fair amount of effort to pull out). 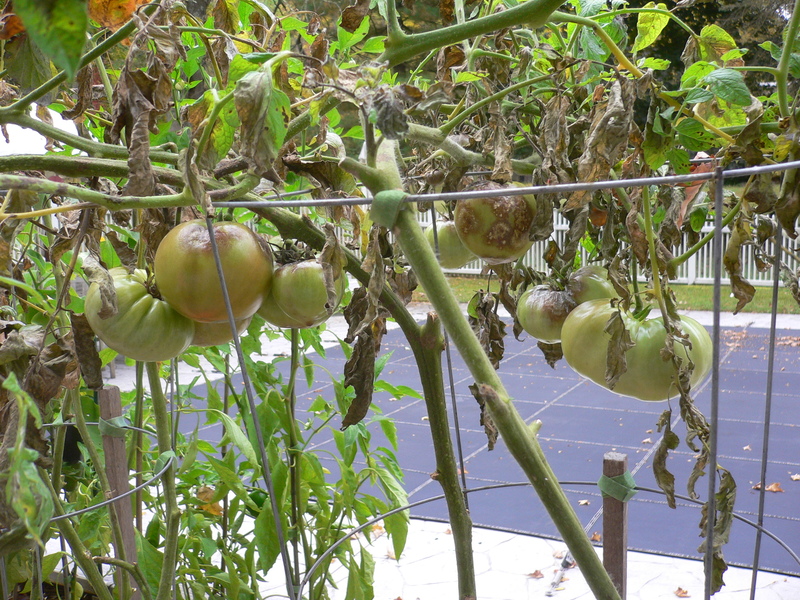 I was also pleased (and surprised) to see that the Country Taste Beefsteak tomato vines continue to resist the late blight; there were no signs of the lesions or brown spots on the leaves or stems. 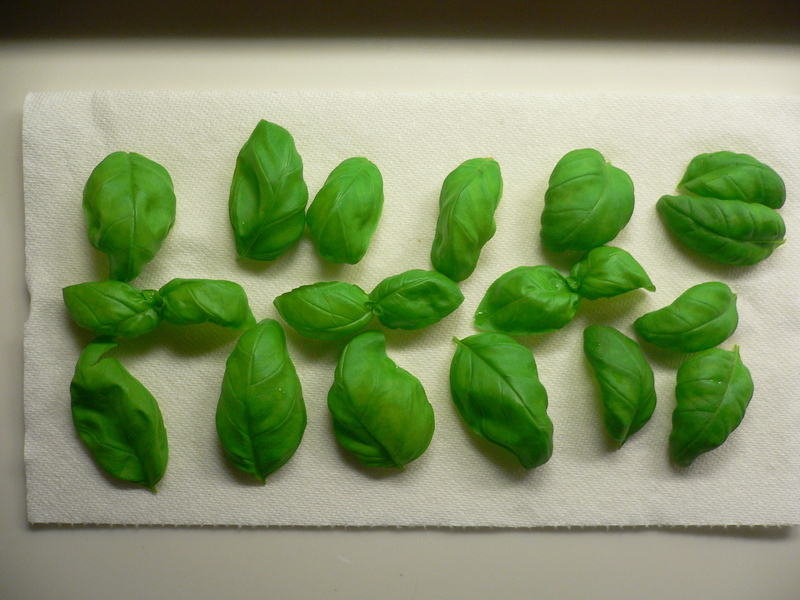 This makes them a very good candidate for next year’s garden. Of course, they are suffering from something else, possibly Septoria leaf spot (my hypothesis is based on review of photos of afflicted plants online) or maybe early blight. Unfortunately, all of these conditions are spread by spores, the production of which is favored by the cool, humid weather that occurs in the fall. 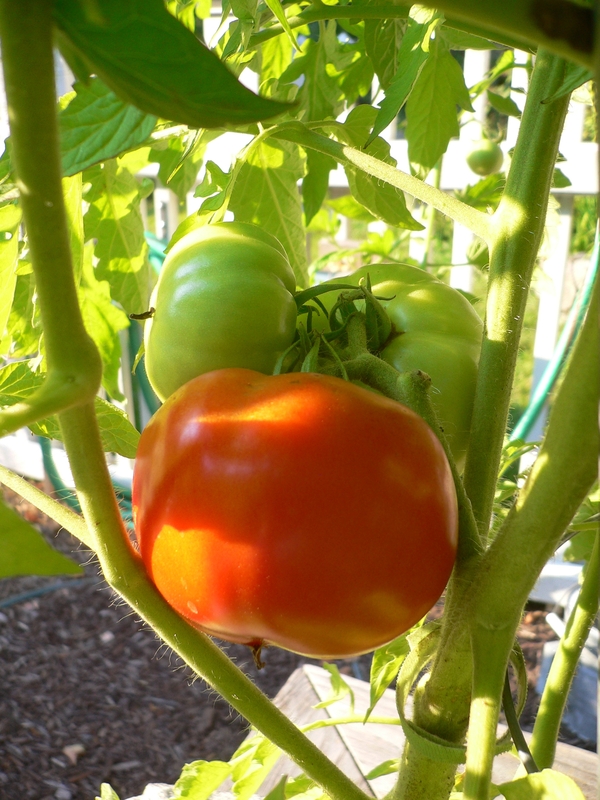 I left the beefsteaks alone (well, I may have trimmed a few branches) in the hope that we will be able to harvest the dozen or so ripening tomatoes that are still on the vine. 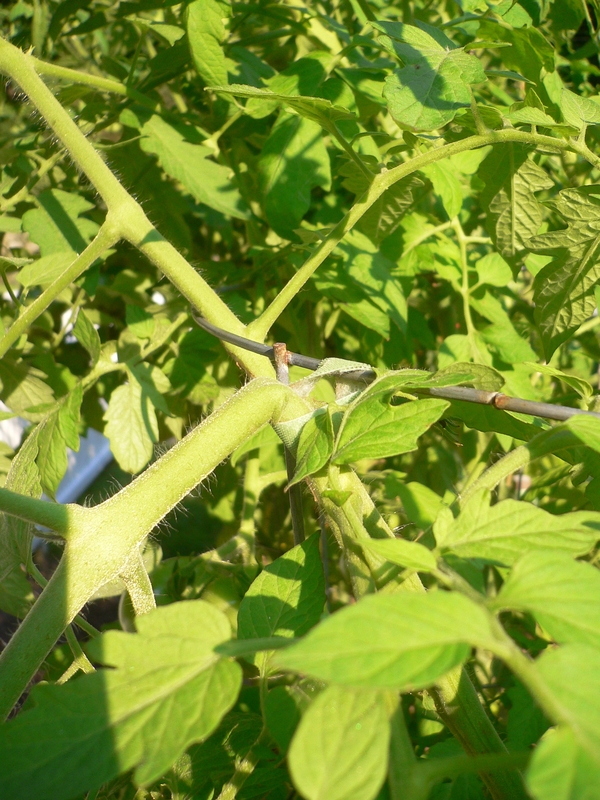 Here’s another thing that can happen when tomato plants extend too far beyond their supports: A far-reaching branch will develop a cluster of fruits which, as they enlarge, weigh down the stem and eventually exceed its capacity. Sometimes the branch will break (and down it will fall); other times it will kink (what as a structural engineer I would call plastic deformation). The latter has occurred with multiple branches of the apparently hapless Country Taste beefsteak tomato vines. 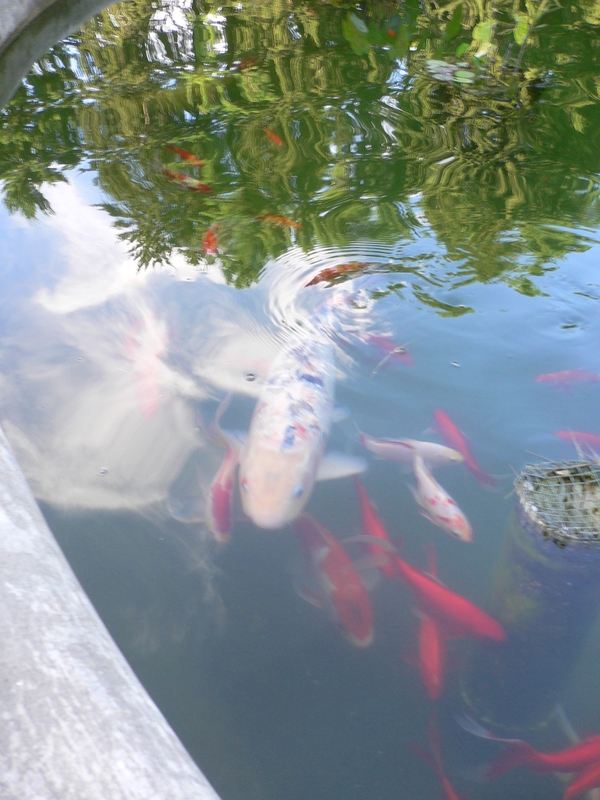 Despite their bad luck, they continue to grow enthusiastically. Or perhaps it is the other way around. Because of their unbridled expansion, they are experiencing mishaps directly associated with their size (see also August 13, 2013). In other words, they are growing too much for their own good. 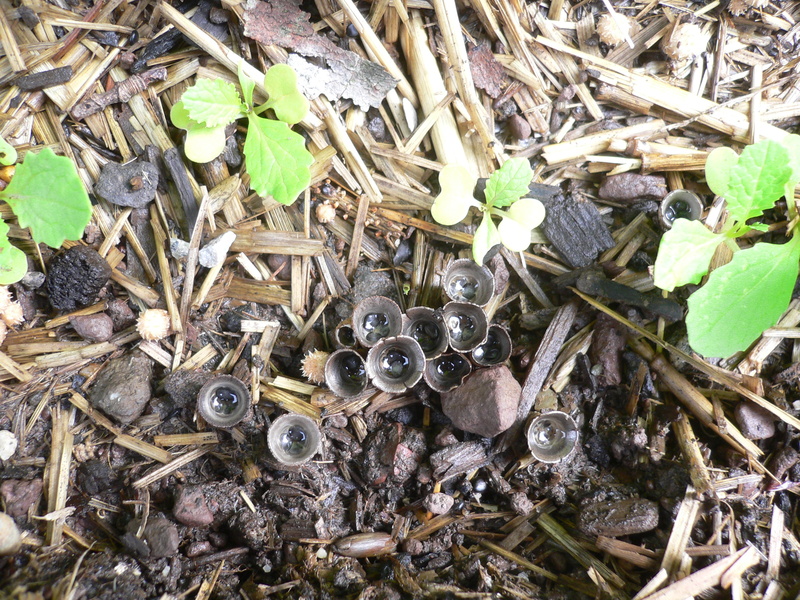 The beefsteaks are not the only ones. 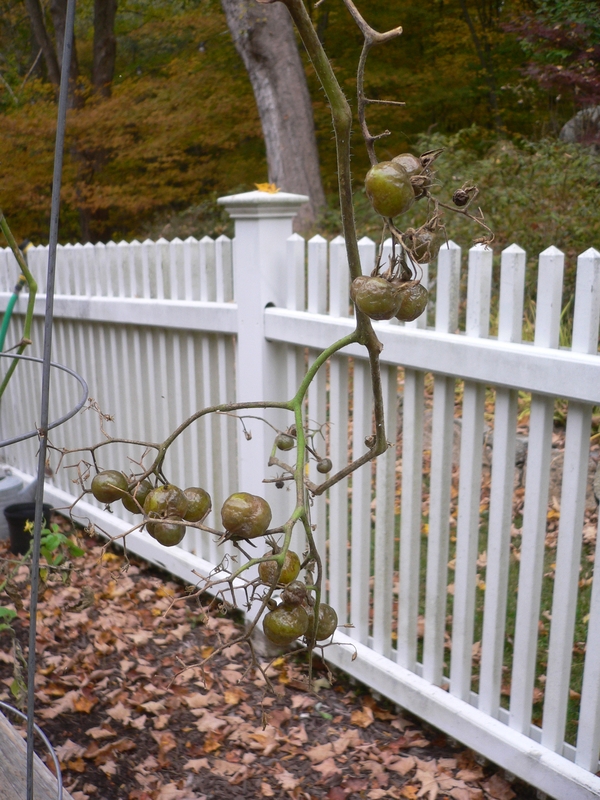 In fact, all of the tomato vines have extended upward and outward from their cages. Each now trails across the top of the adjacent cage to either side of its own. The plants at the ends—the aforementioned Country Taste to the west, the Sungold cherry tomatoes to the east—have no cage to one side. Consequently, their outer branches spill over and downwards, most of them kinked but not broken. It puts me in an awkward position. I had vowed to keep the tomato vines in control by careful pruning. I have clipped the main stems and nipped the suckers on an almost daily basis. But at some point in the last week or so, the vines sped past me during a moment (okay, maybe it’s a day or two) of inattention. And now, not only are the vines very long, they all support several ripening fruit as well. To cut the vines off at this point would mean losing a large part of our crop. So I’ll adjust my approach. On the longer stems, I will prune beyond the last cluster of fruit even if that means abandoning some blossoms. For the vines that remain (and there a lot of them), I will do my best to support them from as many cages as necessary (without allowing the whole works to topple over). We’ve ended up with a tangle of stems and leaves—the very condition I was trying to avoid—but at least we’ll maintain a good supply of tomatoes for the next few weeks. And that, of course, is the whole point. Our tomato harvest has really only just begun. And the Country Taste beefsteak plant is looking to become the biggest producer. We’ve already picked a couple of beauties—large, round, dense—and will be having them tonight for dinner. Finally, a BLT. Baseball has been described as a game of mostly tedious inactivity interspersed with brief moments of intense excitement. For example, a game might go eight innings with only a scattering of hits and no score, a dull display of routine grounders and fly balls. And then the offense makes a charge with a ground-rule double, a successful bunt and a deep line drive. Suddenly, the bases are loaded with no outs. The pitcher is still strong and the manager leaves him in to get out of the inning. The outcome of the game hangs on the next few pitches and it could go either way. Will there be a base-clearing grand slam homer or, even rarer, a triple play to save the day for the defense? Or, as is often the case, will the excitement fizzle out with a pop fly followed by an easy double play at second and first? Gardening could be described in a similar way. For much of the year, nothing much changes from day to day and if one actually stopped to watch, there would not be much to see. 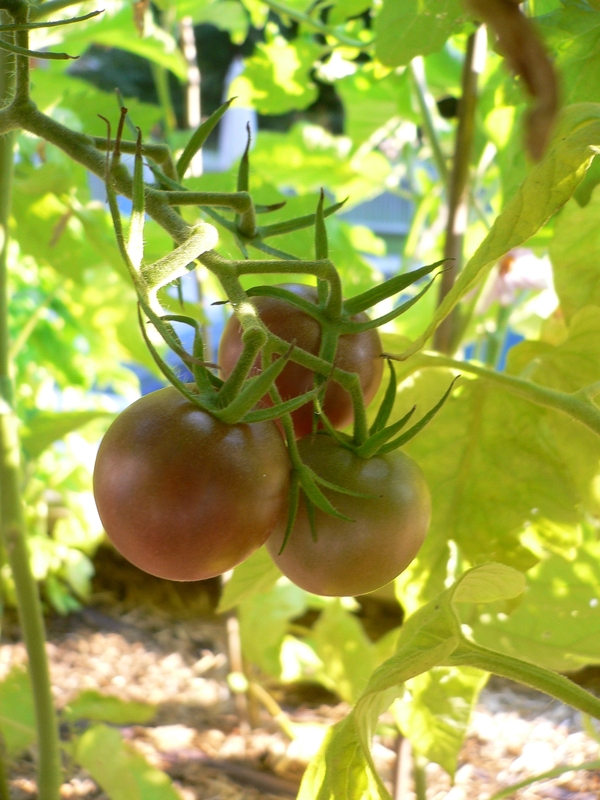 But an emerging seedling, new blossom, or ripening tomato can get one’s blood flowing. In fact, there are other similarities between gardening and baseball that give it a run for the money as America’s favorite pastime. The season starts with the intense physical activity of cleaning up the planters, starting seeds indoors and preparing new beds (spring training). This is followed by the growing of seedlings, a potentially dull period (preseason play) that is not without its exciting moments, such as when the freshly-germinated seeds first pop through the soil surface (the emergence of a potential star player). Of course, the non-performers must be culled (roster cuts). 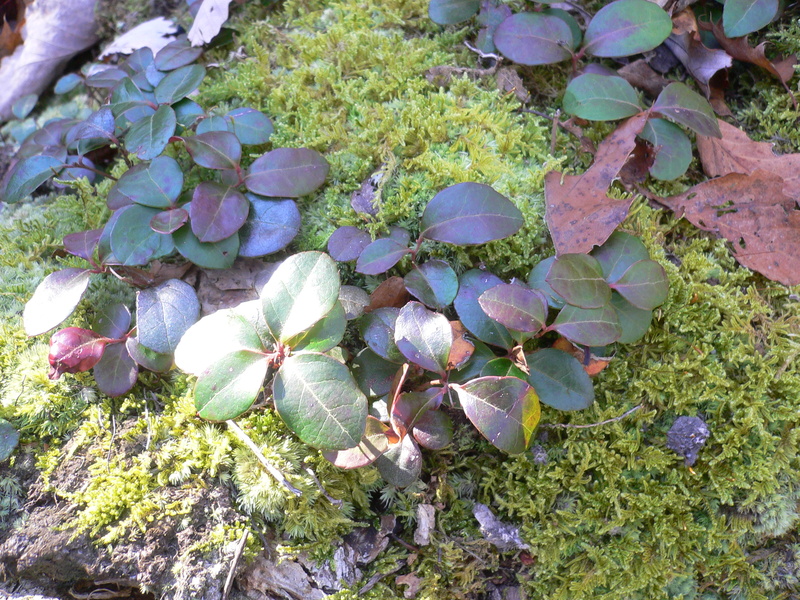 Then comes early spring and the first planting of seeds and seedlings outdoors (Opening Day). Nothing can match the exhilarating feeling of transforming a fallow garden into a verdant patch of hopefulness and promise (anything is possible). 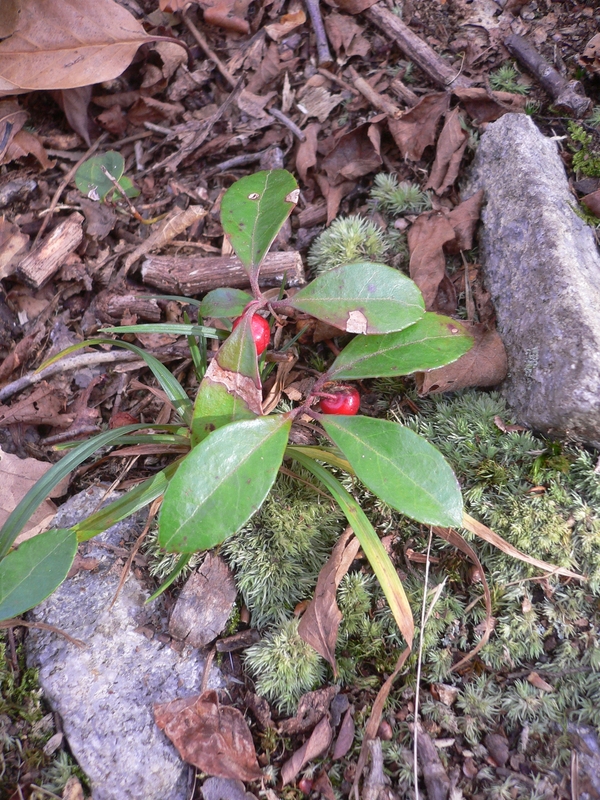 Early Summer is for growing, which can be quite monotonous. There can be long stretches where the garden looks more or less the same every day for a week (early season games). But then the radishes ripen and the Sugar Snap peas start producing and the thrills of having a garden are remembered (a perfect game is pitched). By mid-July, it is clear which vegetables, a particularly productive variety of turnips, say, are the best performers (the All-Star Game). Favorites are determined and shared with family and friends, often accompanied by recipes. Fellow gardeners trade seeds with each other (baseball cards). At summer’s peak, the abundance of the garden is appreciated every day when planning dinner (give me some peanuts and Cracker Jacks). At some point, a friend might gift a seedling of their own to try in the garden (a free agent is signed). Throughout this period, a carefully planned order of succession planting must be followed and, sometimes, tweaked (batting order adjustments). As summer progresses, the early performers are harvested and fade away while later season vegetables take the stage (changes in division standings). Some develop disease or are infested by insects and have to be removed (players placed on injured reserve or out for the season). Others will produce beyond the wildest imaginings (home run hitting records). When fall approaches, only the plants with the greatest stamina still survive (the playoffs). 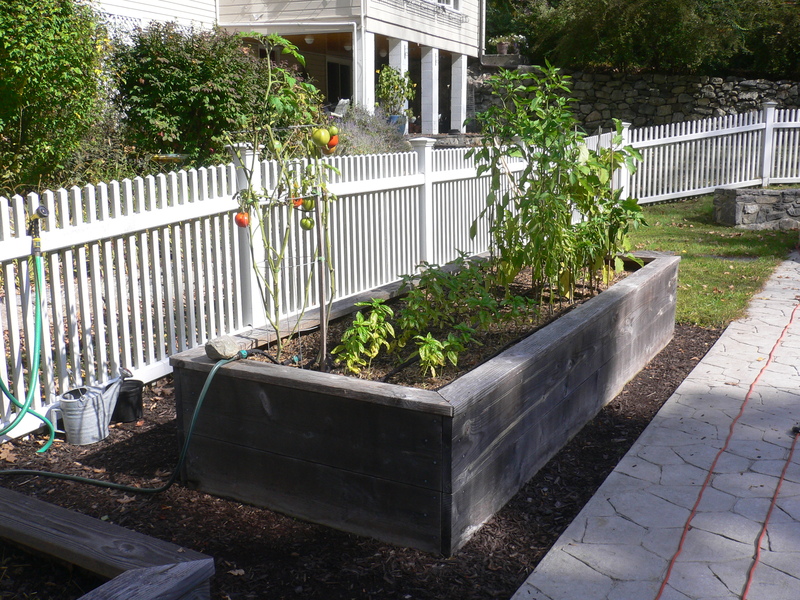 Each week, as the days shorten and the temperature cools, the tomatoes, then the string beans and next the autumn radishes (late-season surge) fall away, unable to sustain their summer success. Finally, only the hardiest plants, such as the winter squashes are still standing (World Series champions). After the euphoria of harvest (the Fall Classic) fades, there is a lull of activity followed by the preparation of the gardens for winter. What grew well and what did not? Tough decisions must be made (off-season trading). Despite the thrills of victory and the agonies of defeat, plans are made for a better garden (just wait until next year!). Yesterday, we drove up to Saratoga Springs, New York, for a quick getaway, a mini-vacation, a brief respite from the everyday. We haven’t planned much—our idea is to keep it simple—and spent yesterday afternoon walking up and down the main street in town, Broadway, and taking a nap (I never claimed to be the life of the party) before going out for a delicious pasta dinner at Wheatfields (highly recommended). The heat wave finally broke and we were actually able to eat outdoors. One of the things we did plan was a visit this morning to the gardens at Yaddo, an artists’ community founded in 1900 by a wealthy couple who, sadly, lost all four of their children. Without heirs, they decided to convert their estate into a sanctuary where young artists, writers, composers and other promising creative types could work without interruption or concern for such mundane matters as room and board. Most of the 400-acre property is off-limits to those who have not applied to the organization, been reviewed by its trustees and found qualified for residency. However, the gardens, which comprise a formal rose garden and more rustic rock garden, are open to the public on a daily basis. 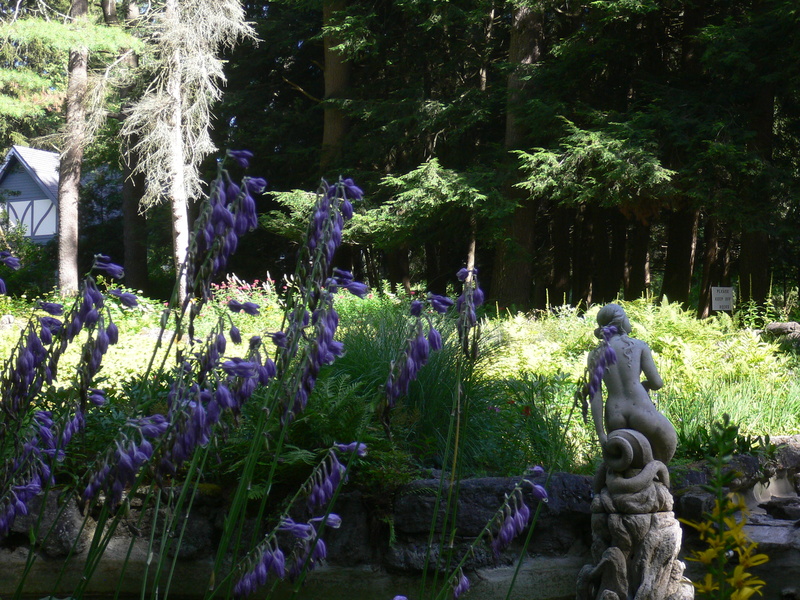 The gardens are tended by the volunteer Yaddo Garden Association, several of whose members were busily at work during our walk-through. 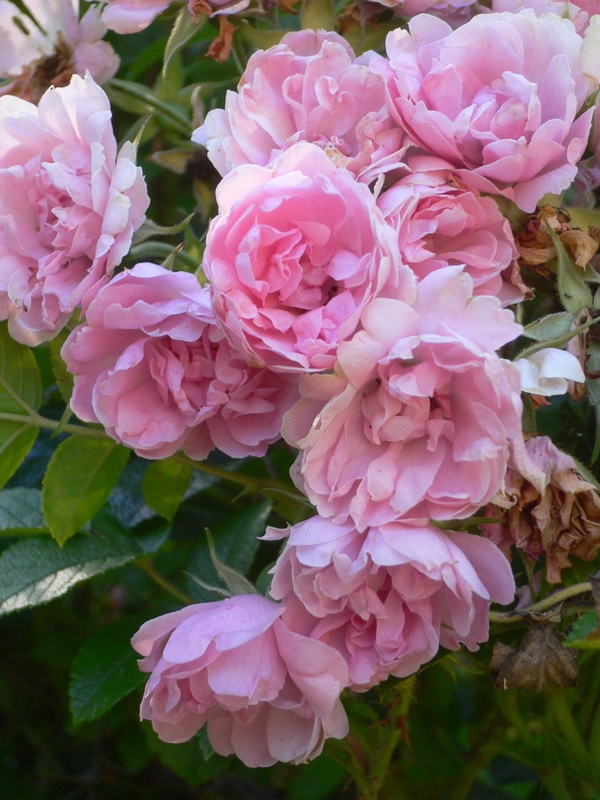 We were a bit late for the roses which probably peaked about a week ago. 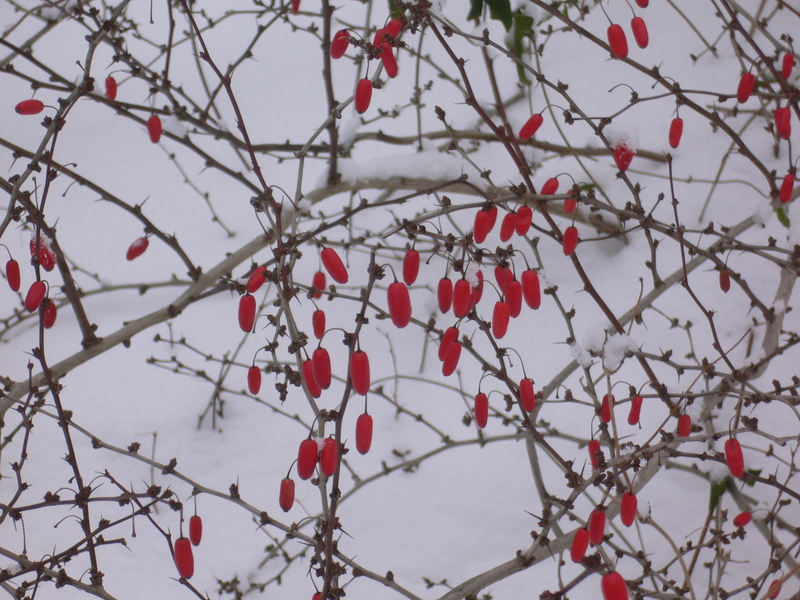 Nonetheless, most of the bushes were still in bloom, even if the flowers were becoming a bit ragged. I am always amazed by the sheer variety of roses whose flowers exist in seemingly infinite combinations of color, size, shape and scent. 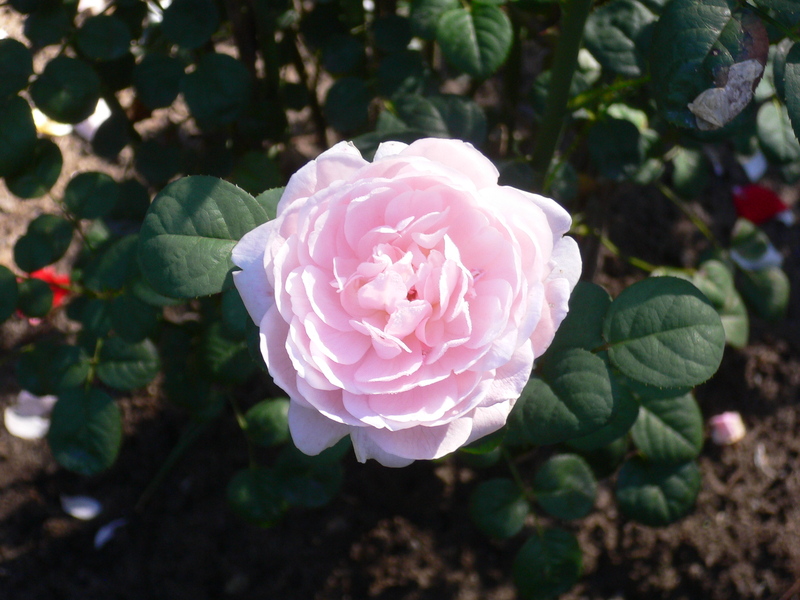 My favorites are the more delicate pinks and peaches, especially the clusters of diminutive tea roses. 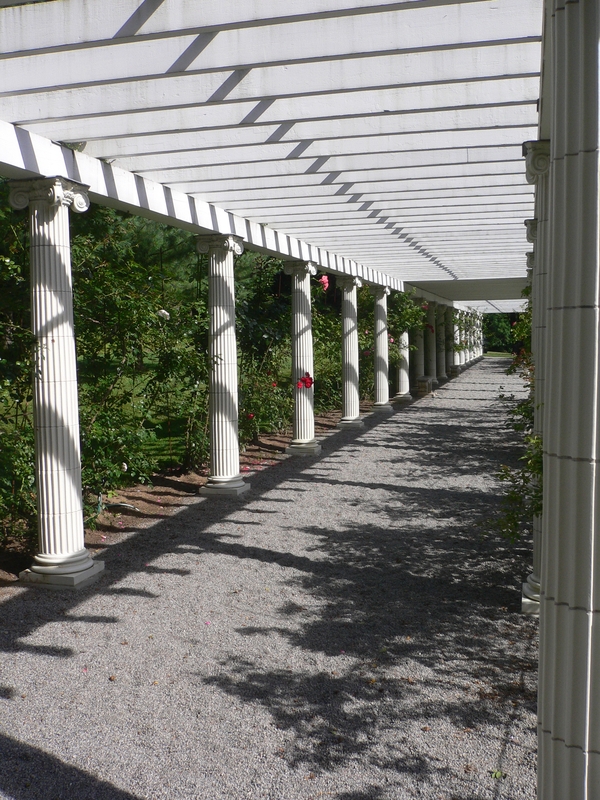 The rose garden is carved out of a stand of spruces which shield visitors from the unfortunate presence of the Thruway, only several hundred feet to the east. Unfortunately, the trees are not dense enough to attenuate the constant drone of trucks and automobiles racing by at 70 miles per hour. One has to use some effort to imagine oneself at the turn of the last century when the surrounding countryside was less populated and much quieter. The rock garden, located west of the rose garden and divided from it by a classical colonnade, is somewhat more serene and much more shaded (fewer trees were removed to create it, apparently). The flora here are much more familiar to me (in appearance if not in name) and include an impressive array of hostas, most of which were in full bloom. The dense canopy of the woods must have protected them from the merciless sun of the last few weeks. The garden is not a place for instant gratification. Advance planning is recommended (if not, strictly speaking, required). Depending on the scope and extent of a garden’s design, much work must be done to construct it and make it ready for planting. 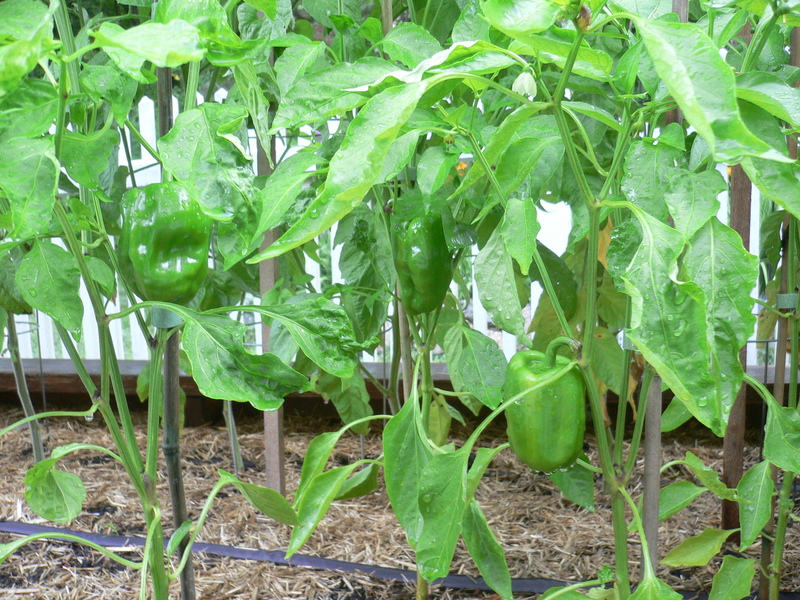 And once the seeds are sown or the seedlings set out, the plants take time to grow, mature and produce fruit. 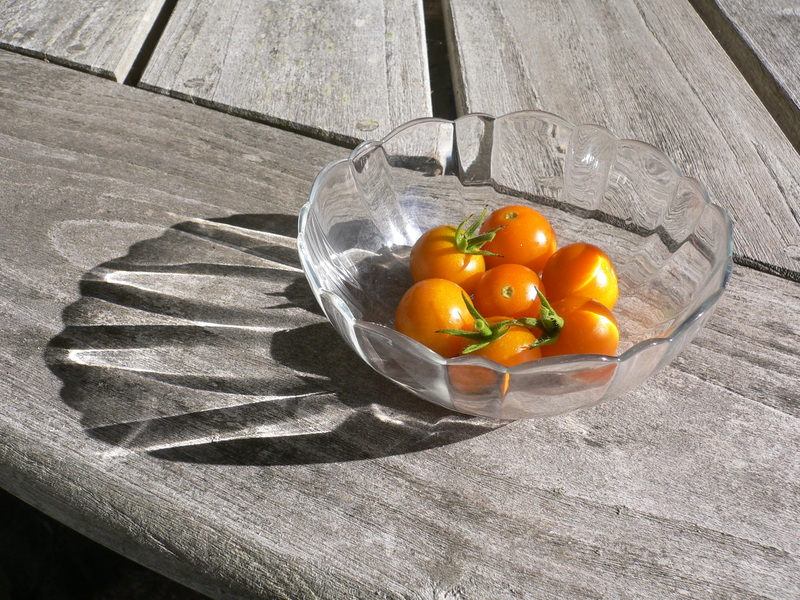 If one wants a ripe cherry tomato—right now!—planting a cherry tomato vine is not the way to get it. And although many people do demand instant gratification (as my mother recently observed, it used to be only children; now it’s everyone), there are obvious benefits to waiting. Like the study that offered children one piece of candy immediately or two pieces if they agreed to wait for an hour, a garden promises a prolonged bounty of vegetables (nature willing, of course) to those who take the time to nurture it. As an added bonus, the produce is usually of much higher quality than anything that can be procured in a market, especially when out of season. Also, it is my experience that instant gratification often leads to deferred aggravation. For instance, if I put off making a minor household repair (and here, the instant gratification is putting my feet up and watching television instead), that leaky faucet or loose floorboard may develop into something requiring more extensive—and expensive—work to remedy. And whenever I go too long without weeding, Mother Nature teaches me a lesson by allowing them to overrun the garden. Unless, of course, that is the ultimate goal. Yet another variation of the anti-proverb states, “Never put off till tomorrow what you can avoid all together”. We’re running behind with the cucumbers which should have been in the ground over a week ago. With plans for the weekend, we decided to make time during the working week to get caught up. The cucumbers, like the squash, are moving out of the box. Specifically, we are locating them along the fence behind the west planter, safely distant (we hope) from the east planter where they grew last year. Next year, we will move the cucumbers to that portion of the fence. I briefly considered putting the cucumbers behind (i.e., north of) the squashes where there would be no danger of their being shaded. But that would be putting all of our cucurbits in one basket. 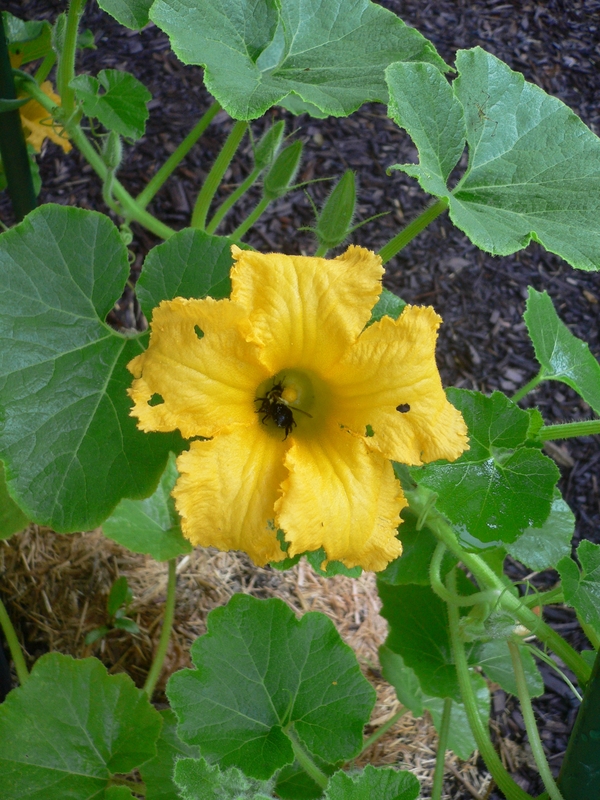 Because they are susceptible to the same harmful insects (e.g., the ubiquitous cucumber beetles) and diseases (such as the seemingly omnipresent powdery mildew), the cucumbers and squashes will be better off if kept as separate as possible. Besides, at this time of the year, the sun casts a very shallow shadow. 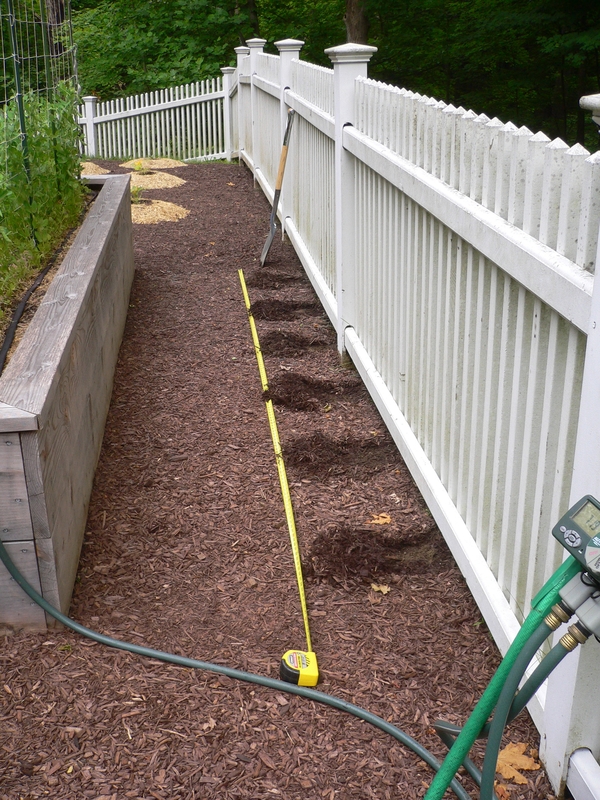 We measured six locations, spaced at two feet on center, and brushed away the cedar mulch. Rachel used a standard shovel and I used a spade to dig holes about six inches deep. It is interesting that a standard shovel is best suited to a hemispherical hole while a spade, with its flat, rectangular blade is better for cubical excavations. 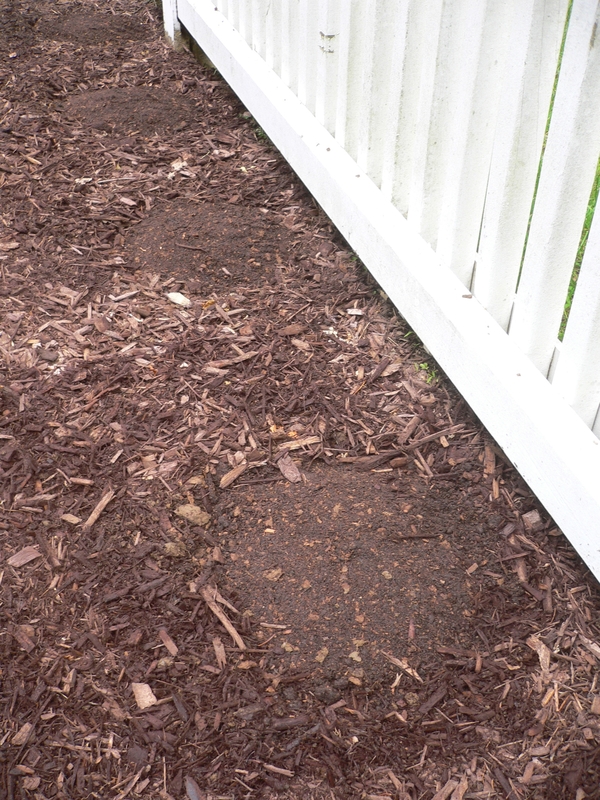 The shoveled holes were about eight inches in diameter; the spade-dug holes were approximately six inches square. 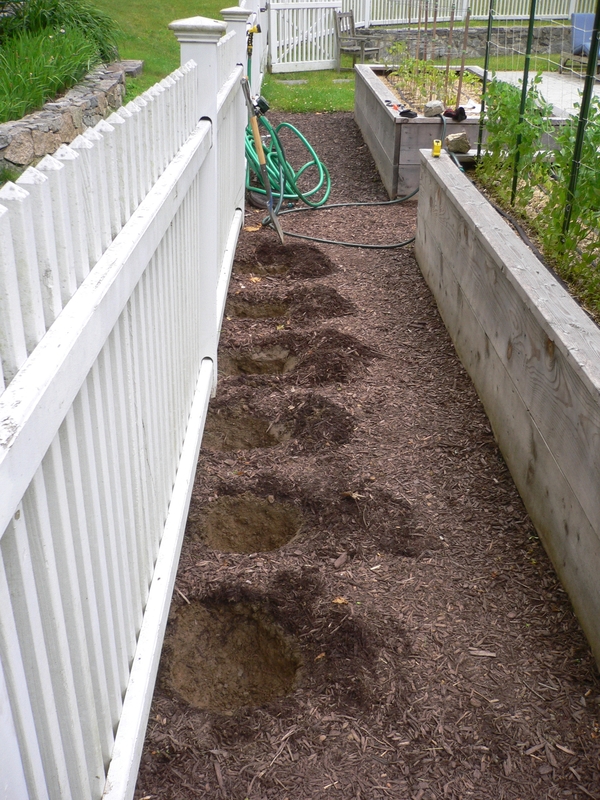 Once the holes were completed, we mixed up two batches of soil (each batch consisting of one 40-pound bag of compost and an equal volume of peat moss) and filled the holes. We kept the mounds small in diameter (especially compared to the squash mounds) because they are located along an access aisle. 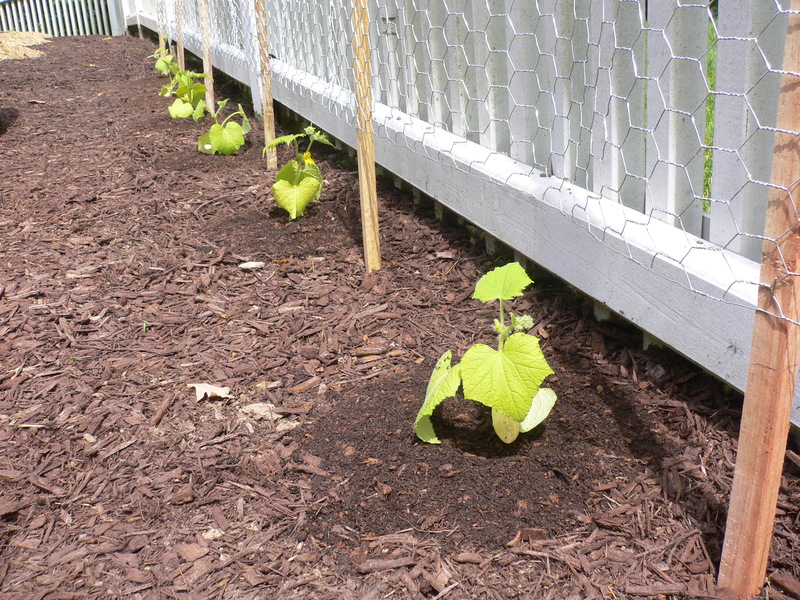 We want the cucumbers to be as tight against the fence as possible. We expect that the cucumbers will grow high and wide. 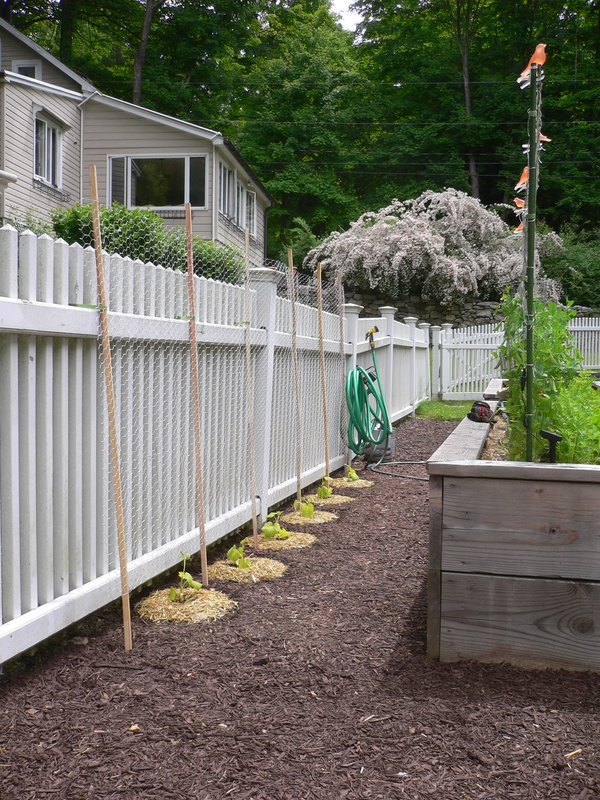 To support their wandering branches we installed a chicken wire trellis along the fence. We marked locations for six cedar posts (seven might have been better but we were short by one) and, using an old steel chisel and a sledge hammer, formed pilot holes. This step is necessary due to our rocky soil. Then, we pounded in the stakes. I had originally planned to embed the six-foot stakes by 18 inches but had to stop at a foot (the depth of the pilot holes). Once a stake encounters a rock, there is a risk of splitting or crushing it with further pounding. Using our trusty Velcro tape, we tied each of the stakes to the top rail of the pool fence. 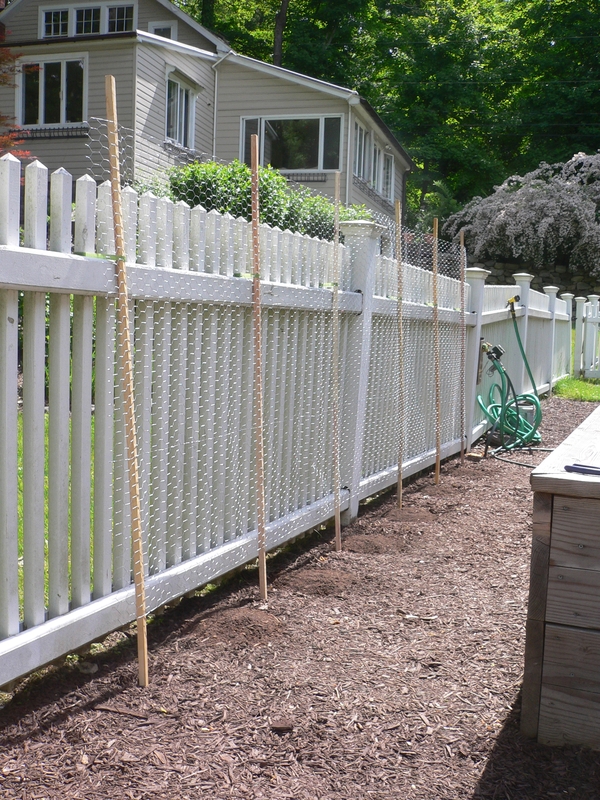 The stakes have a slight backwards rake to them (their bases are about three inches outboard of the fence) which will both stabilize the trellis and prevent it from feeling too imposing. To form the trellis, we unrolled a 12-foot length of four-foot-high chicken wire and stapled it to the stakes using an electric staple gun. (We acquired this tool many years ago for reasons I can no longer recall. It always strikes me at first as silly—like an electric carving knife—and yet it is very useful and practical. Although it delivers a staple with great force it does not otherwise disturb the work and requires very little effort. In that regard, it is more akin to a pneumatic nailer.) We held the bottom of the chicken wire eight inches above grade to give the young cucumber plants room to sort themselves out. After that, we set out the cucumber seedlings, alternating the slicing and pickling varieties for visual interest. On a leaf of one of the pickling cucumbers, I noticed a small white spot that might—I say, might—have been the beginning of a powdery mildew infection. Just to be on the safe side, we tossed the seedling on the refuse pile and chose another. Powdery mildew on the cucumbers is almost inevitable (we’ve had it every year) but we certainly don’t need it this early in the season. To wrap up the planting (literally and figuratively), we dressed the soil mounds with straw mulch. 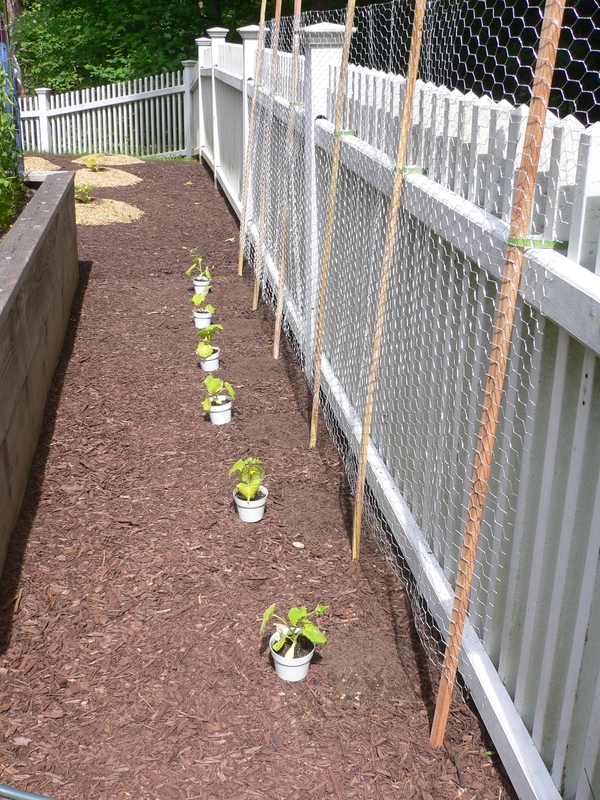 In addition to all of its other advantages—moisture retention, weed control, erosion prevention—the mulch will act as a visual marker of the cucumbers presence, just like the yellow tiles on the edge of a subway platform. 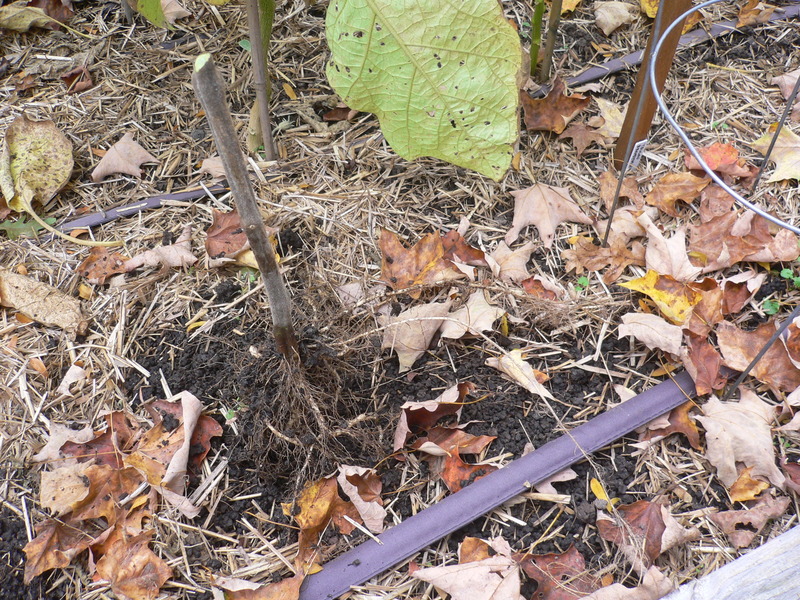 While installing the trellis, we found that it was easy to accidentally step on the mounds and now that the cucumbers are resident, we don’t want that happening again. Due to the trellis’ location, I had to remove the hose rack and then reinstall it on the fence, two pickets to the right (east). Eventually, we will install a timer-controlled soaker hose to irrigate the cucumbers but today, I gave them a bucketful of water (laced with fish emulsion). 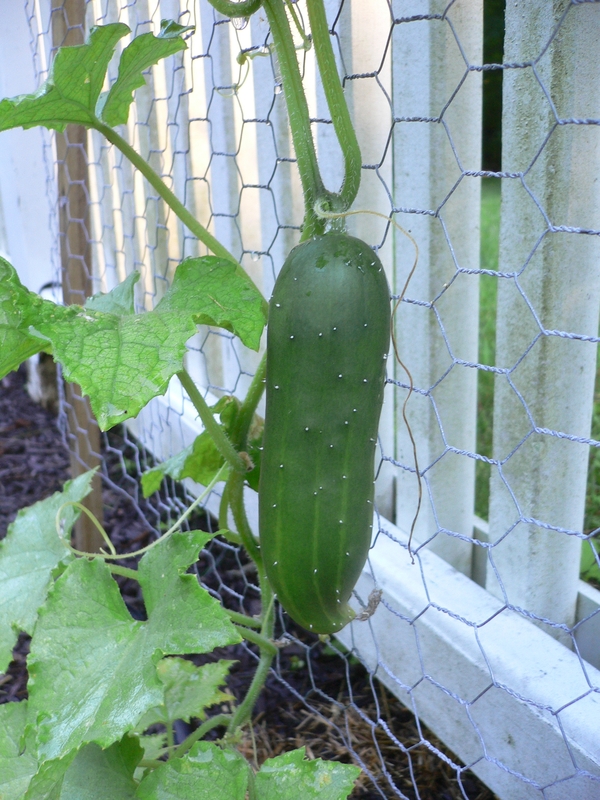 Tomorrow, rain is forecast (as Tropical Storm Andrea makes its way up the Atlantic coast) so the cucumbers should get plenty of water.